Tortellini with homemade basil pesto has easily become of one my favorite go-to weeknight dishes, especially when I get home late and want to get dinner on the table fast. 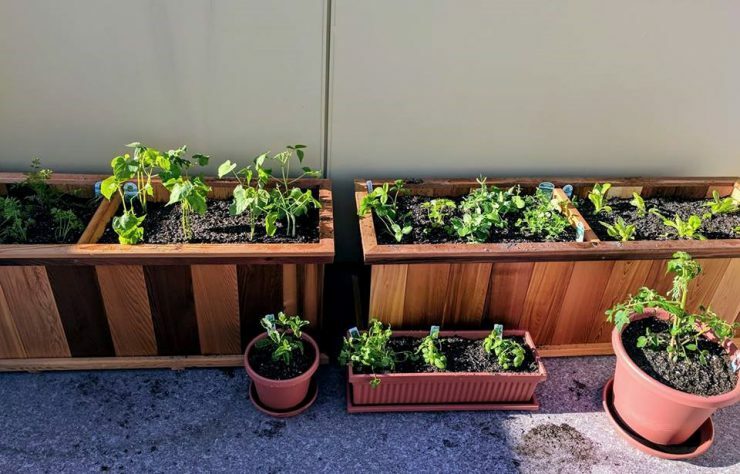 I planted basil on our rooftop this summer and fortunately, I was able to make a large batch of pesto each time I harvested the leaves. I used my favorite new kitchen appliance, our vacuum sealer, to package and seal the pesto, then froze it. 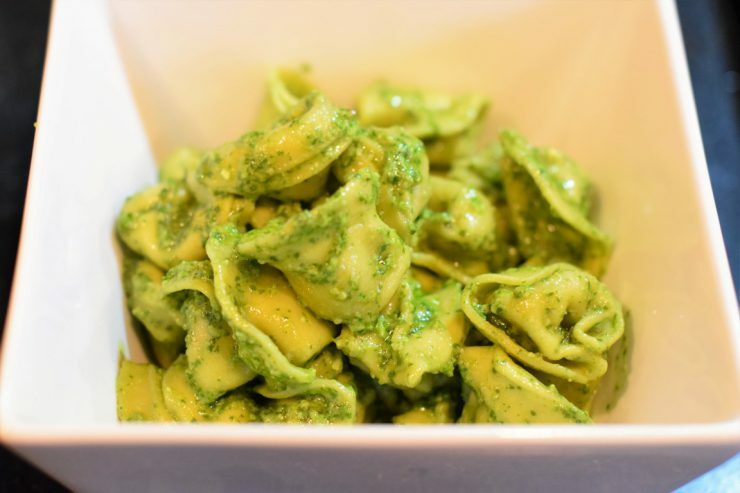 Now I have what seems like an endless supply of pesto on hand, making this meal even easier! To make basil pesto, start with about 2 cups of fresh basil leaves, rinsed and patted dry. Add leaves and 1/4 cup pine nuts to a food processor. Sometimes (more like when I have the extra time) I like to toast the pine nuts before adding to the pesto for a nuttier flavor. To do this, preheat the oven to 250ºF, spread the pine nuts out in a thin layer on a baking sheet, and toast for about 5 to 7 minutes. Watch them carefully because you don’t want them to burn. Remove the pine nuts from the oven and cool completely before adding to the food processor. Add in 1/2 cup Parmesan cheese, 2 gloves of garlic, the juice of 1/2 of a lemon and salt and pepper to taste. Pulse until it’s roughly combined, then stream in about 2/3 cup olive oil while the food processor is running. I tend to eyeball this and stop pouring in oil once the pesto is combined and it reaches the desired consistency. I also usually stop the food processor at least once or twice while combining to scrape down the sides. Once completely combined, you’re done. It’s really that easy. 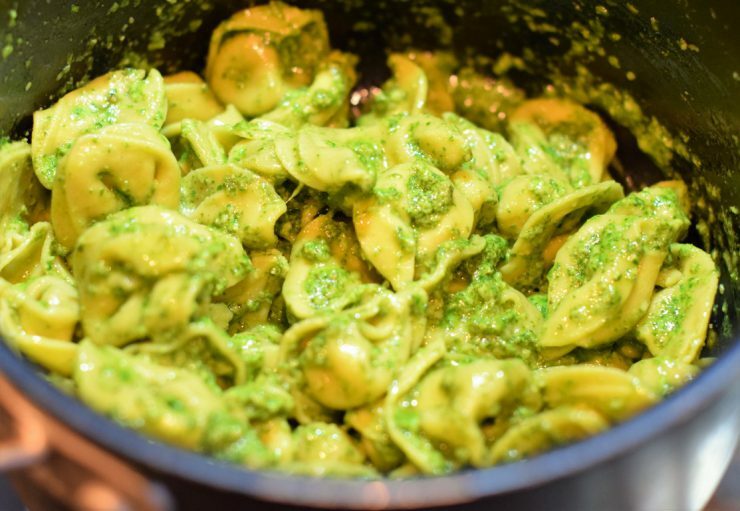 I like to cook up tortellini with basil pesto, but you can use any time of pasta (or skip the pasta and add the pesto to a protein like chicken). 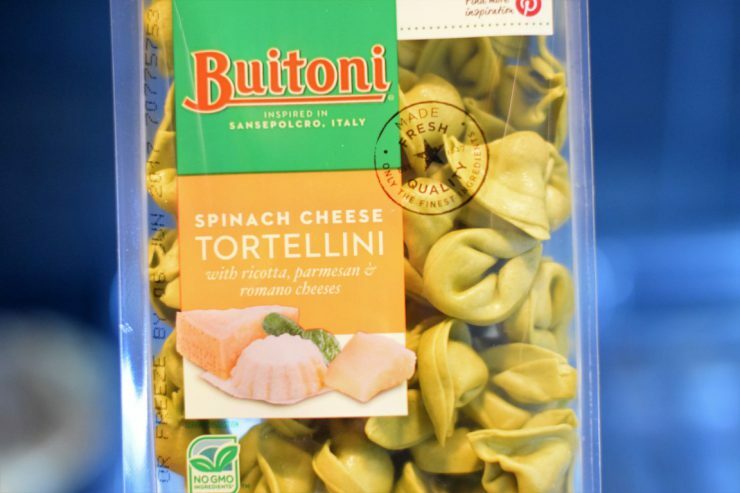 If you’re going the pasta route, cook the noodles per the package instructions. 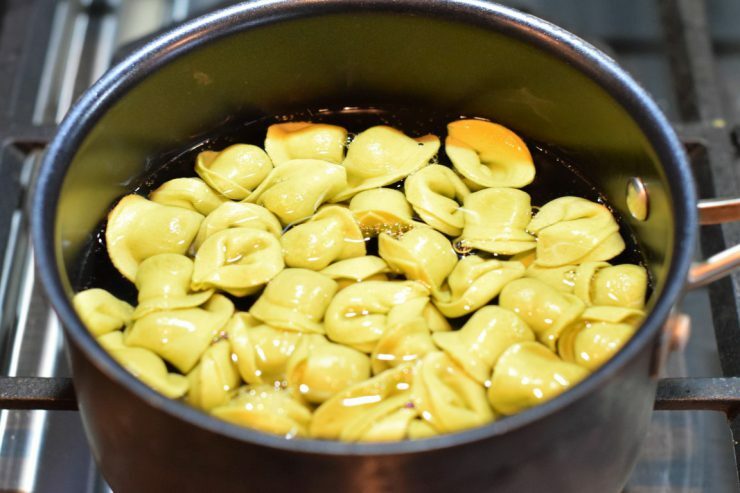 For tortellini, it’s usually about 3-5 minutes in a pot of salted, boiling water. Drain the pasta once cooked. Then add enough pesto to generously coat the noodles. I tend to eyeball this based on personal preference. 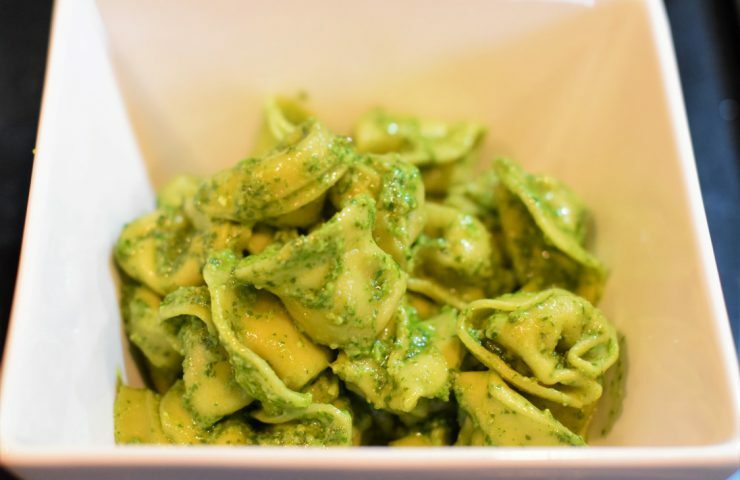 You can add as much or as little pesto as you want. 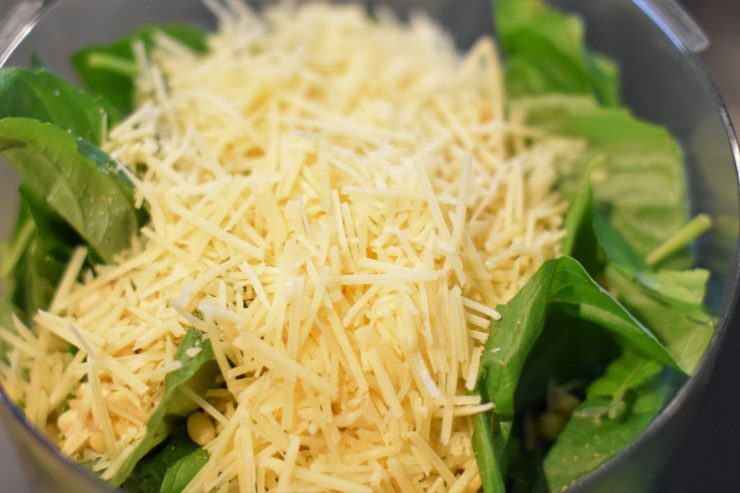 Top with a little extra Parmesan cheese and enjoy immediately! 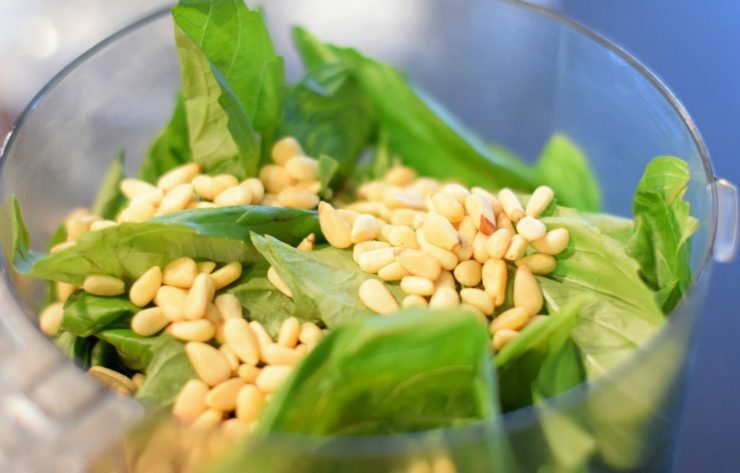 In a food processor, add basil, pine nuts, Parmesan cheese, garlic, lemon juice, salt, and pepper. Pulse a few times to start mixing. 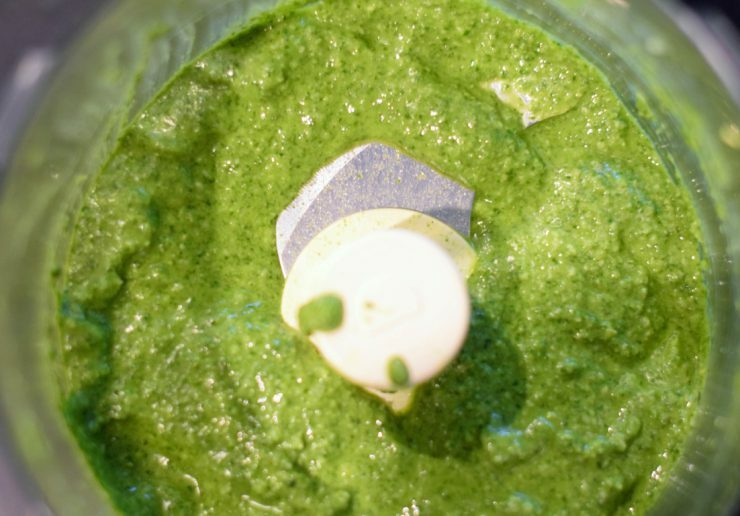 With the food processor running, slowly stream in olive oil until the ingredients are fully combined and the pesto reaches the desired consistency. 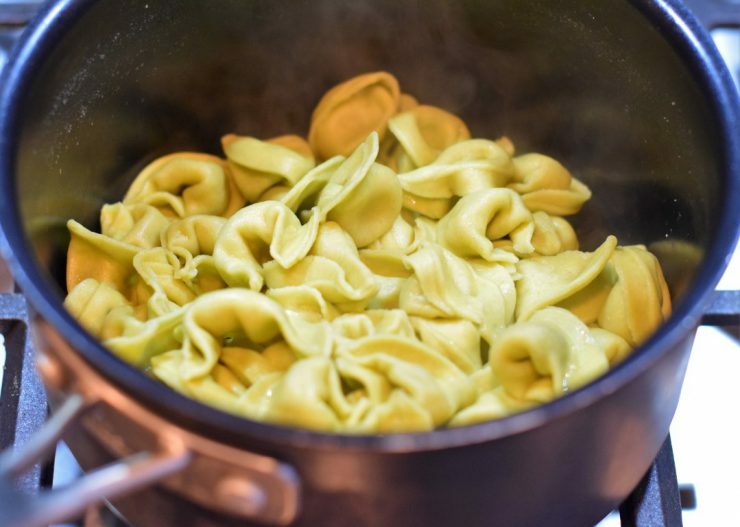 Once cooked, add in desired amount of pesto to coat the pasta. Garnish with extra Parmesan cheese and serve immediately.